All eyes were on Japan on Sunday as ONE Championship made its long awaited debut with a star-studded event including four title fights and the first appearances of both Demetrious Johnson and Eddie Alvarez. In the end, two new champions were crowned and a super fight was set up for ONE’s return to Japan later this year. 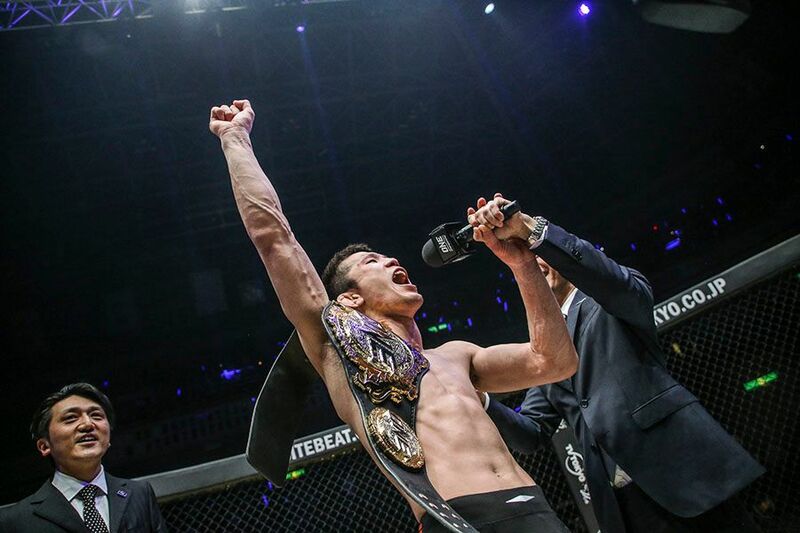 The main event saw Shinya Aoki compete at home for the first time in more than three years as he avenged a prior loss to Eduard Folayang and once again became the ONE lightweight champion. Never one to disguise his game plan, Aoki immediately shot across the cage like a cannonball and started looking for the takedown to put Folayang on the canvas. 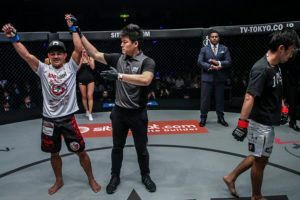 Once Aoki got the fight to the ground, he brought the ferocious striker from the Philippines into his world and it was seemingly only a matter of time until he wrapped up the submission. Sure enough, Aoki passed through Folayang’s defense like it was non-existent and then he latched onto an arm triangle choke from the top. Folayang fought the submission as much as he could, pulling down on his own arm and trying to stave off the choke. In the end he couldn’t fight it off and Aoki eventually choked out Folayang to finish him and reclaim the lightweight title he lost back in 2016. With the win, Aoki (43-8-0-1) will now enjoy a little down time as he awaits the winner of the ONE Lightweight World Grand Prix currently ongoing with the semifinals now determined following Sunday’s event from Japan. Folayang drops to 21-7. 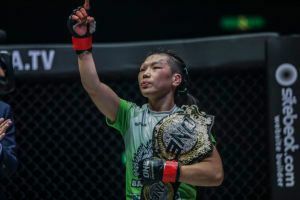 Xiong Jing Nan had to survive a brutal fourth round submission to then power back and earn a fifth round TKO to defend her ONE strawweight title while simultaneously handing Angela Lee the first loss of her career. Lee moved up to challenge for a second world title as the ONE atomweight champion and she was seemingly just seconds away from popping the champagne bottles to celebrate a fourth round submission win. Following a strong start to the fight through the first two rounds, Lee slowed down slightly in the third, which then allowed Xiong to start mounting a comeback. Xiong began peppering Lee with a barrage of punches that had the 22-year old Hawaiian on her heels for the first time all night. Between rounds, Lee’s coaches told her to abandon the striking and instead take Xiong down to the ground. Lee listened and almost immediately put Xiong on the canvas, defending submission attempts from the top. Lee eventually moved to take Xiong’s back and that’s when she locked up a reverse triangle choke before then transitioning into an armbar attempt. The fight was seemingly finished because Lee had the arm hyperextended and Xiong was just watching her elbow get twisted and torqued in the exact opposite direction it was intended to go. Still, Xiong kept scrambling to escape the submission and eventually she made it to the end of the round. Xiong popped up from the ground as if nothing just happened while Lee was gasping for air, trying to get some oxygen back into the muscles that were just exhausted in the attempt to finish the fight. As the fifth round got started, Lee was gasping for air and Xiong was going for the kill. Xiong blasted Lee with a barrage of punches including one to the body that stung the ONE Atomweight champion in a bad way. Smelling blood in the water, Xiong followed that with another blistering body shot that folded Lee in half as she leaned against the cage for support. Xiong quickly followed up with a few more punches but the referee had already seen enough as he stepped into stop the contest. The fight delivered everything as promised and more with Xiong (14-1) eventually finding a way to defend her title while sending Lee (9-1) packing back to the atomweight division with only one title around her waist. The first fight was an instant classic but Aung La Nsang had no desire for another 20 plus minute war with Ken Hasegawa in the rematch. This time around, the Myanmar superstar put Hasegawa away in the second round with a crushing right hand that put his opponent down and out for good. Heading into Sunday’s card, Aung La Nsang had said that he made a lot of mistakes in the first fight that allowed Hasegawa to stick around until the fifth and final round. He had no intentions of repeating history and ‘The Burmese Python’ backed it up with a strong showing from start to finish this time around. Aung La Nsang unleashed a full on assault on Hasegawa from the moment the fight started as he began targeting the body with a brutal series of kicks and then going up top to the head to continuously keep his opponent guessing. After leaving bruises and welts on the side of Hasegawa’s rib cage, the reigning ONE light heavyweight and middleweight champion seized on the opening to then go for the knockout shot to the head. A right hand straight down the middle blasted Hasegawa square in the face and he crumbled down to the mat. La Nsang quickly followed up with a few more shots on the canvas and eventually the referee knew that Hasegawa wasn’t going to come back this time. The fight was stopped and La Nsang (25-10-0-1) celebrated the win as he once again defended his middleweight championship. Hasegawa (16-4) is now 0-2 in title fights against the Burmese two division champion. Afterwards, La Nsang was joined in the cage by ONE heavyweight champion Brandon Vera, who respectfully asked to face him for the light heavyweight title in Japan this October. The reigning two-division champion happily accepted and it appears ONE Championship already has a main event set up for later this year as Vera returns to light heavyweight to challenge La Nsang for his title. Bibiano Fernandes is once again the ONE bantamweight champion but not in the fashion he wanted to win back the belt from Kevin Belingon. 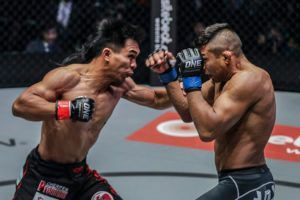 It was a non-stop action affair in the third fight between the two rivals with Belingon drawing first blood with a rapid-fire combination that had Fernandes wobbled in one of the first exchanges of the fight. Fernandes was able to stave off any further attacks as he recovered and then he came back with his own barrage of strikes. While he’s best known for his ground game, Fernandes seemingly threw caution to the wind as he began dropping bombs on Belingon, who was definitely hurt and put into survival mode. 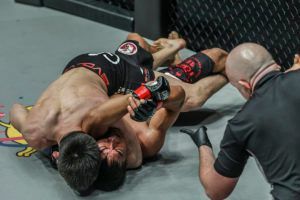 The fight did eventually hit the ground and Fernandes was once again in control, passing through Belingon’s defense and moving into a dominant position where he started fishing for the rear naked choke. The round ended before Fernandes could finish the fight but he was back for more as soon as the second round got underway. Fernandes was a man on a mission as he was consistently going for the kill with Belingon trying to defend the onslaught of offense. Unfortunately after Fernandes secured a takedown with just over one minute expired into the round, Belingon unleashed a series of elbow strikes from the bottom including at least one that blasted the Brazilian in the back of the head. The fight was paused due to the illegal strikes and after five minutes it was clear that Fernandes would be unable to continue. Due to the fight ending because of the illegal elbows to the back of the head, Belingon was disqualified and the bantamweight championship returned to Fernandes. Obviously it was a disappointing end to what started out as a barnburner of a fight and chances are Fernandes (23-4)and Belingon (20-6) will cross paths again later this year to hopefully settle the score once and for all. 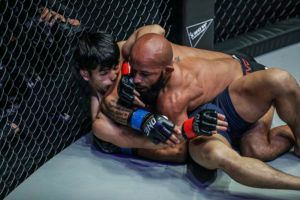 Former UFC flyweight champion Demetrious Johnson got his ONE Championship career off to a good start with a second round submission to finish Japanese challenger Yuya Wakamatsu. Obviously, Johnson was heavily favored going into the matchup but he didn’t exactly walk through Wakamatsu, who was a game opponent from start to finish. By the time the first round ended, Johnson had a sizable mouse growing under his right eye that showed off Wakamatsu’s handiwork. As the second round got underway, Johnson started to settle into a better rhythm once he figured out Wakamatu’s power and timing. 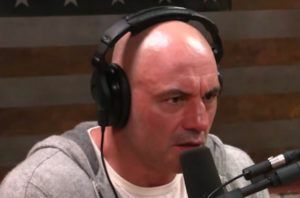 Johnson was pressing forward with his takedowns and eventually trapped his opponent against the cage where he began unloading a series of knee strikes to the head. With Wakamatsu defending the strikes, he failed to protect his neck and Johnson (28-3) quickly seized on the opening, locked on the guillotine choke and pushed him against the cage to exert extra pressure. Wakamatsu (12-4)had no choice but to tap out as Johnson earned the submission victory. It was a successful debut for Johnson, who now moves onto the next round of the ONE Flyweight Grand Prix. His opponent will be determined at a later date after injuries forced the other opening round tournament bout off this card last week. For anybody who thought Eddie Alvarez was just going to roll through to the finals of the ONE Lightweight World Grand Prix, Russian knockout artist Timofey Nastyukhin had something to say about that. In one of the most anticipated fights on the entire card, Nastyukhin earned a jaw-dropping first round TKO to finish the former UFC and Bellator champion in his ONE Championship debut. As soon as the fight got started, Nastyukhin was firing punches at Alvarez, showing absolutely no fear in the face of true MMA legend. It was clear from the early exchanges that Nastyukhin was controlling the distance and after he tagged Alvarez with a couple of shots, the American born fighter was quickly aware of his opponent’s power. While Alvarez kept coming back for more, Nastyukhin started to land with more regularity including a series of stinging right hands that really began to mount the damage. 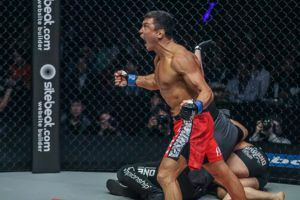 Finally with Alvarez getting a little wild with his combinations, Nastyukhin made him pay with a glancing shot that tagged the 35-year old veteran and sent him staggering towards the cage. Nastyukhin quickly followed up with a huge barrage of shots that crumbled Alvarez down to the mat as the referee rushed into stop the contest. With the win, Nastyukhin (13-4) moves into the semifinals of the ONE Lightweight World Grand Prix where he faces Lowen Tynanes while Alvarez (29-7-0-1) searches for answers following a stunning loss in his first appearance in ONE Championship. Danny Kingad notched his fifth win in a row overall but not without an absolute battle over three rounds with late notice replacement Senzo Ikeda in the final prelim at ONE: ‘A New Era’. The exchanges between these two flyweights were fast and furious with Kingad getting the better of Ikeda in the multitude of exchanges on the feet and on the ground but the Japanese fighter refused to go away. It was a back and forth battle throughout with Kingad just able to edge out Ikeda during a few key moments that helped him secure the victory. Kingad now moves to 12-1 in his career with his only loss coming to current ONE flyweight champion Adriano Moraes. Ikeda drops to 12-7-1. Meanwhile, former ONE flyweight champion Kairat Akhmetov was officially the first fighter to move into the semifinals of the ONE Flyweight Grand Prix after a lopsided win over Reece McLaren. Despite coming from a strong Greco-Roman wrestling background, Akhmetov seemed happy to use his grappling prowess to stop McLaren from dragging him to the mat and then making him pay with striking exchanges on the feet. Akhmetov landed a flash knockdown in the opening round and he continuously mounted damage with each passing minute while McLaren looked flustered trying desperately to get the fight down the ground. After three rounds, Akhmetov had clearly done more damage while fending off any attempts from McLaren (12-6) to surge ahead with a comeback late. Akhmetov (26-2) earned the unanimous decision win as he now moves forward in the flyweight tournament. Akhmetov and Kingad are now scheduled to meet in the semifinals of the ONE Flyweight World Grand Prix with the winner then moving onto the finals later this year. Mei Yamaguchi wanted nothing more than to fight on the first ever ONE Championship card in her home country but she had to survive a valiant effort from newcomer Kseniya Lachkova on the prelims. Yamaguchi was able to secure several takedowns but she had to fend off some submission attempts from Lachkova off her back including one armbar that had the former atomweight contender in trouble for a few moments. She eventually worked her way free and then began to maintain control on top with Lachkova stuck playing defense on the bottom. Finally in the third round, Yamaguchi once gain secured top position but this time in a scramble managed to latch onto an arm before falling to her back looking for the submission. Yamaguchi wrenched back on the elbow to lock on the armbar and Lachkova had no choice but to tap out or return home to Russia with a broken limb. Yamaguchi (19-11) got the submission win over Lachkova (10-3) and then bathed in the cheers from an adoring audience in Japan. Grappling expert Garry Tonon moved to 4-0 in his career after making quick work of Anthony Engelen on the preliminary card. While Tonon was quick to get a takedown in the opening seconds of the fight, he opted not to look for submissions and instead focused on a ground and pound focused offense. Engelen did his best to defend the barrage of strikes but Tonon just continued to chip away at him while constantly dragging him down to the mat whenever the Indonesian featherweight managed to get up for a moment. Finally with less than a minute to go, Tonon advanced into the mount and just started blasting away with huge looping punches on the mat and Engelen was doing nothing more than covering his head and hoping he could make it to the end of the round.